This article was originally published on 5/10/13 and was updated 4/11/18 –ed. Are you’re finished with high school and ready to kick off an amazing summer before heading to college in the fall? If you answered ‘yes’ to the previous question, Senior Week in Ocean City, Maryland is the answer you have been looking for. So, pack your bathing suits, shades, and suntan lotion, gather your friends, and head east for a week that you are sure to remember for the rest of your life. Making life long memories isn’t always easy, but the following activity guide is full of events, activities, and entertainment ideas that will allow you to make the most of your vacation, and make you forget all about that summer job your parents are making you get when you get home. Whatever you do, be sure to Play It Safe! Ocean City may be world renowned for its 17 full-length, professional golf courses, but it is also home to the best miniature golf in the region. In fact, the putt-putt scene is so plentiful that you won’t need to stray more than a few blocks to find an elaborate course with challenging obstacles. While there are many viable contenders, such as Maui Golf, Lost Treasure Golf, and The Embers, Old Pro Golf is OC’s undisputed champion because it offers four themed courses, including two indoors, that are sure to capture your imagination and challenge your skills, rain or shine. If you’re a savvy shopper searching for exceptional savings, Tanger Outlets is the place for you. With dozens of your favorite brands, including American Eagle, Coach, J. Crew, Tommy Hilfiger, the Gap, Under Armor, and many more, you are sure to find the clothes, shoes, and accessories. When you’re ready to refuel after a long day of fitting rooms and full-length mirrors, stop by Mione’s Pizza and Italian Restaurant (‘the Best of’ 2013 winner for pizza), a pizza place you won’t find outside of Ocean City that’s located right in the Tanger Outlets. 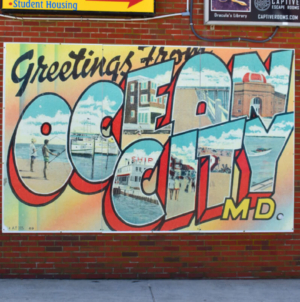 Ocean City, Maryland lies at the heart of the Chesapeake Bay watershed, and, as a result, is home to some of the region’s most beautiful and exotic tributaries, canals, and waterways. 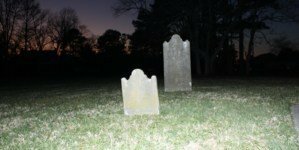 Unfortunately, many of the most scenic places in Worcester County are hard to access because they are nestled away and hidden by nature. 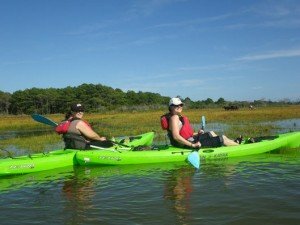 Fortunately, however, Ocean City is home to numerous business offering kayak rentals and guided tours to help you explore those hard to reach areas. 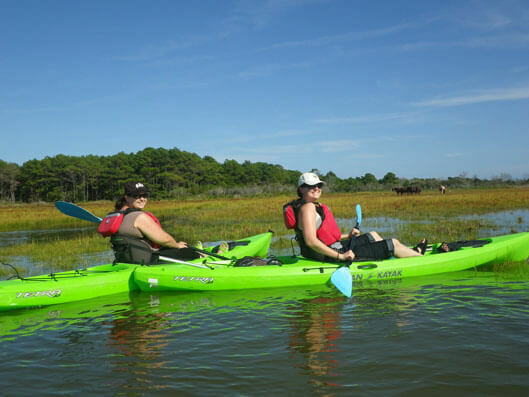 Ayer’s Creek Adventures is a frequent ‘Best Of’ winner for the Best Kayak Rental/Experience, and with plenty of kayaking options across town, your personal nautical adventure is only moments away. Walking down Ocean City’s famous Boardwalk is great. Biking down Ocean City’s famous Boardwalk is even better. If you want to give your legs a break and peddle your way to an amazing day, there’s a handful of bike rental stores right on the Boardwalk including Dandy Don’s, Wobbly Wheel and Bike World. 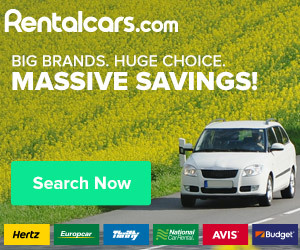 Whether it’s beach cruisers, surries, banana bikes, tandems, or motorized wheel chairs you’re looking for, you can find them on the Ocean City Boardwalk, and at a just graduated-friendly price, too. 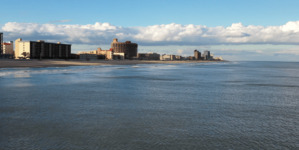 Ocean City offers a wide array of watersports, ranging from mild to extreme. Somewhere between parasailing and paddle boarding lands jet skiing; laid back and relaxing for the casual rider, but with enough speed and excitement for even the most serious adrenaline junkie. To maximize your jet skiing experience, opt for a company who’s ride area is along the Assateague National Seashore, so you can take in the sandy white beaches littered with wild ponies. Odyssea Watersports and Bayside Boat Rentals are two of the top jet ski rental facilities in town, both of which always top our Best Of list. Get down to the docks and don’t let the fear of never jet skiing before keep you off the waters, each rental company offers on-site licensing, safety equipment, and insurance. Have you ever wondered what Ocean City looks like from a seagull’s perspective? Try an afternoon of parasailing for a bird’s-eye view of OC that will leave you breathless. Tan beach bodies may be hard to see at 800 feet, but the scenic beauty from the wide open sky will make you forget all about the bikinis and board shorts down below, at least for a little while. Paradise Watersports took home oceancity.com’s Best of 2013 award because it offers some of highest views and lowest rates around, but with a multitude of other options, such as Odyssea Watersports next to Seacrets, OC Parasail, OC Baysports, and OC Bayside Rentals, offering a variety of packages and weekly deals, finding the perfect parasailing experience for you has never been easier. Fries may have originated in France centuries ago, but they were perfected in Ocean City in 1929. That is the year Thrasher’s French Fries opened its doors, and closed the debate about how fried potatoes are supposed to be prepared. Ever since, Thrasher’s has been providing locals and tourists alike with the freshest, most delicious fries ever to emerge from a deep fryer. If you’ve yet to indulge in the Thrasher’s French Fries experience, stop everything you are doing, make your way to 2nd St.and the Boardwalk, and treat your taste buds to these tasty spuds. 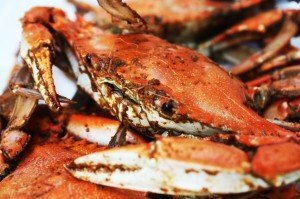 Steamed crabs are more than just a delicious delicacy in Maryland, they are a way of life. Whether you’re an expert picker, or don’t know your lump from your backfin, All-You-Can-Eat (AUCE) crabfeasts are the best way to enjoy the Chesapeake Bay’s greatest treasure. In addition to the Old Bay covered crustaceans, AUCE feasts usually also include an assortment of other local favorites, such as fried chicken, clam strips, hush puppies, corn on the cob, and crab soup. 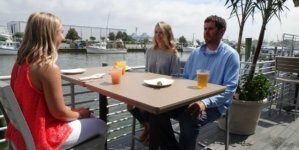 Crabs are at a premium in Ocean City, so grab your crab mallet, and your appetite, and head to the nearest crab house (Hooper’s Crab House, Bahama Mamas, and the iconic Phillip’s Crab House come to mind). But be warned, regardless of how much you eat, an all-you-can-eat crab feast is sure to leave you hungry for more. 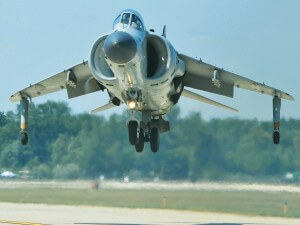 Do you like high speeds, fearless skydivers, and death-defying stunts…for free? If you’re lucky enough that your senior week lands on the weekend of June 16-17, head to the beach and look to the sky for the awe-inspiring aviation experience known as the OC Air Show. Did we mention it’s FREE? 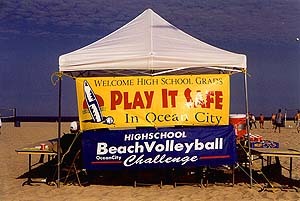 Play It Safe is about more than avoiding drug and alcohol abuse during a week best-known for particular debauchery. It’s also about having tons of fun without spending tons of money! (Because let’s face it, you’ve probably blown your last paycheck just on your hotel’s security deposit.) Their calendar of free events includes everything from laser tag to beach karaoke. You can keep up-to-date with more Ocean City events, for senior-weekers and everyone else, on our event directory, too.